NO PURCHASE OR PAYMENT NECESSARY (EXCEPT DATA OR MESSAGE RATES MAY APPLY) TO ENTER OR WIN. A PURCHASE OR PAYMENT WILL NOT INCREASE YOUR CHANCES OF WINNING. THIS PROMOTION IS INTENDED FOR PLAY IN THE UNITED STATES ONLY AND WILL BE GOVERNED BY U.S. LAW. DO NOT ENTER IF YOU ARE NOT ELIGIBLE AND LOCATED IN THE UNITED STATES AT THE TIME OF ENTRY. 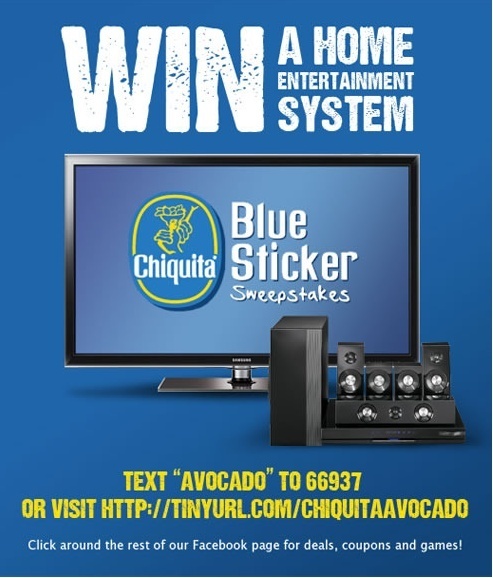 ELIGIBILITY: The Chiquita Avocado Blue StickerSweepstakes (“Sweepstakes”) is open only to legal residents of the 50 U.S. states including the District of Columbia, who are 18 years of age or older at the time of entry. Employees, directors, officers, and agents of Chiquita Brands LLC., ("Sponsor"), its parent companies, divisions, affiliates, subsidiaries, advertising and promotional agencies, and suppliers involved in the Sweepstakes (“Promotion Parties”), as well as the members of each of their immediate families (spouse, parents, children, siblings, and in-laws) and persons residing in the same household of as such individuals are not eligible to enter or win. Void where prohibited by law. HOW TO ENTER: The Sweepstakes begins at or about 12:00:00 a.m. Eastern Time (“ET”) on 09/16/11 and ends 11:59:59 p.m. ET on 11/15/11 (“Sweepstakes entry Period”). There are two ways to enter during the Sweepstakes: 1) by using an SMS-enabled device to text keyword Avocado to 66937 Text Message Entry"); or 2) by going to http://tinyurl.com/chiquitaavocado and completing the official online entry form. All eligible entries must be received by 11:59:59 p.m. ET on 11/15/11 to be eligible. All entries become the sole property of the Sponsor and will not be returned. For Text Message Entries: Standard text message and data rates apply to each message sent or received. Other charges may apply; check your mobile plan for rates/details. Participation may not be possible on all carriers. Please note that proof of text message submission does not constitute proof of delivery/receipt. If you send a text message, you will receive at least one (1) text message in response. All entries must be received no later than 11:59:59 p.m. ET on 11/15/11 to be eligible. Limit of one (1) entry per person/mobile number/email address regardless of method of entry. If more than one (1) entry is received from the same person, or phone number, only the first entry will be considered valid and Sponsor may choose to disqualify all entries submitted by that person at Sponsor’s sole discretion. WINNER SELECTION/NOTIFICATION: Winners will be selected in a random drawing conducted on or about 11/17/11 from among all eligible entries received. The drawing will be conducted by an independent judging organization, whose decisions are final on all matters relating to the Sweepstakes. Odds of winning depend upon the number of eligible entries received from both methods of entry. Prizes will be awarded assuming sufficient eligible entries are received and prize is properly claimed. Potential winners will be notified by phone or email and must respond back within 72 hours from date/time of notification or Sponsor may, in its sole discretion, select an alternate winner from remaining entries. Sponsor is not responsible for any change in an entrant’s email address, phone number or mailing address. PRIZES: One (1) Grand Prize: a Home Entertainment Package consisting of a Samsung 55” LED-backlit LCD TV, Samsung Blue Ray home theatre system, , prize includes delivery, cables, brackets and wall mount TV and wall speaker system installation, shipping and sales tax, and a $500 Best Buy Gift card, subject to restrictions, terms and conditions stated on gift card. Approximate Retail Value of Grand Prize: $4,600.00. Selection of brand/model of Grand Prize components subject to change at Sponsor’s discretion Four (4) First Prizes: of Avocados for a year, provided as 52 – coupons for one (1) free Avocado (up to $1.99 each).Terms and conditions on coupons apply. Approximate Retail value of each First Prize: $100.00. Limit one (1) prize per person/household. Unclaimed prizes will not be awarded. WINNER VERIFICATION: Potential Grand Prize winner is subject to verification of eligibility and compliance with these Official Rules. The potential Grand Prize winner will be required to sign and return an Affidavit of Eligibility and Liability/Publicity Release (except where prohibited) within seven (7) days of attempted notification or prize will be forfeited in its entirety and may be awarded to an alternate winner. Sponsor is not responsible for any change of email address, mailing address and/or telephone number of entrants. Failure to provide all required information and a signature on the documents will result in forfeiture of winner’s right to claim a prize and may be awarded to an alternate winner, if time permits. Grand Prize will be fulfilled by Sponsor with a retailer located near winner’s home residence. First Prize winners will receive prizes via First Class mail. In the event of noncompliance with these Official Rules, or if prize notification is returned as undeliverable, the prize will be forfeited and may be awarded to an alternate winner. Prizes won by an eligible entrant who is a minor in his/her state of residence will be awarded to minor’s parent or legal guardian who must sign and return all required documents. PRIZE TERMS: Prizes are not transferable and include only the items specifically listed as part of the prize. No substitution or cash equivalent of prize is permitted except at the sole discretion of the Sponsor. If a prize, or any portion thereof, cannot be awarded for any reason, Sponsor reserves the right to substitute prize with another prize of equal or greater value. Any portion of prize not accepted by winner will be forfeited. Federal, state, and local taxes on prize and any expenses relating to the acceptance of and use of prize not specified herein are the responsibility of winners. Sponsor will issue an IRS Form 1099-MISC to Grand Prize winner. Approximate retail values are as of the time the rules were printed and the value of a prize may fluctuate. A winner is not entitled to any difference between the ARV and the actual value of the prize at the time the prize is awarded. Winner acknowledges that Promotion Parties have not made nor are in any manner responsible or liable for any warranty, representation, or guarantee, express or implied, in fact or in law, relative to any prize, including but not limited to its quality, mechanical condition or fitness for a particular purpose. Any and all warranties and/or guarantees on a prize (if any) are subject to the respective manufacturers’ terms therefore, and winners agree to look solely to such manufacturers for any such warranty and/or guarantee. RULES REQUEST: For a copy of the official rules, go to https://www.facebook.com/Chiquita during the Sweepstakes period. WINNERS LIST: For the names of the winners, go to https://www.facebook.com/Chiquita after 11/30/11 after all winners have been confirmed. Sponsor: Chiquita Brands LLC, 250 East Fifth Street, Cincinnati, OH 45202. NO PURCHASE NECESSARY TO ENTER OR WIN. Standard text message and data rates apply to each message sent or received. Sweepstakes begins on 09/16/11 and ends on 11/15/11. There are two ways to enter: 1) by using an SMS-enabled device to text keyword Avocado to 66937, you will receive at least one text message in response; or 2) by going to http://tinyurl.com/chiquitaavocado and completing the official online entry form. All eligible entries must be received by 11:59:59 p.m. ET on 11/15/11 to be eligible. Sweepstakes is open only to legal residents of the 50 U.S. states including the District of Columbia, who are 18 years of age or older at the time of entry. Void where prohibited. Sponsor: Chiquita Brands LLC, 250 East Fifth Street, Cincinnati, OH 45202.